See scan - perfect condition. This is the Mongolian WWII combat merit medal - 2nd type made out of silver plated bronze and having an enamel ribbon and hook. The medal is numbered 18796. 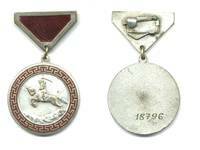 Nice and rare militaria collector piece.